Last year we had just one plum on the tree – it’s first year producing. This year, we’ve gotten almost a hundred so far and still more to be picked. They’re small, but good! Believe it or not, I do nothing except keep the long branches pruned so they don’t bend way over and break, no fertilizer, no bug spray, etc. I was very surprised that the tree was so fruitful this year, and only three were found with any sort of blemish whatsoever. How weird is that, right? They were just perfect and about the size of apricots. I bought the house in 2005 and the tree was small, about a year or two old then, so it’s maybe a seven year old tree just bearing now. Same with the peach tree, which isn’t doing quite so well. For starters, the entire tree consisted of one puny vertical branch up until last year when I threatened to yank it out entirely if it didn’t grow. My threat worked and all of sudden, the tree is bushy and about 9 feet high. It, too, had a proliferation of tiny peaches. Has, actually – it’s fruiting now. But since it’s the first year, even though there are hundreds of 1.5 inch peaches all over it, peach trees apparently are needy in the way of insecticide to keep the little bug nibbles and spots off of them. I don’t do bugs (ick) but I also don’t do bug spray, so I dunno. I can, however, pass on this advice from my father-in-law who has a hugely successful peach orchard of nearly 900 trees in several varieties about five miles from here (in NE NC): after the peach tree (and I assume this could apply to the plum, too) blossoms have turned to little fruit nubs, if you want decent sized fruit, you need to snap off nearly a third or more of the baby fruit so that there is not too much on any one branch – about a full hand’s spread apart, he says. Yes, it seems crazy and he thought so, too, when the Ag guy showed him how to prune and “pinch” fruit that first year! First, it keeps the branches from getting heavy and breaking (which if you keep it pruned to under 10 ft high and no more than 4 ft branch extensions should help). Second, it allows more nutrients to flow into the remaining fruit and thus bigger size. He sells them to the local supermarkets as well as a private client list, so I trust his know-how. He does use pesticides and fertilizer, which ick me out, but the peaches are the size of baseballs, so he’s the expert. The only other contributing factor for the plums I can think of (besides age of trees and maintenance on my part) is that we had a particularly long (for here) and wet cold snap this winter which must have benefitted the trees.We’re original from NW NJ, so we know from apple trees needing a frost to produce sweet fruit and that bulb flowers need to “chill” in the ground to get good flowers in the spring – here, it doesn’t get cold long enough for either. Speaking of which, the five-variety apple tree that came with the house and is more like ten years old, is also having a bountiful year – but same as the peach tree as far as size and quality of fruit. Next year (if I”m still here), I will definitely do the “pinching” off of the excess fruit! What are you doing to make your plums grow? 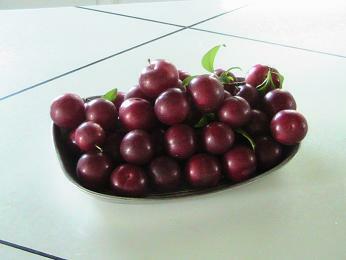 I have two plum trees and last year they produced about thriteen plums a piece. This year one did not produce at all and the other only set two plums.